It is a typical day at one of the ten Wisconsin Child Care Resource and Referral agencies when the staff gets the news. Two more child care providers in their region have closed, leaving families who depend on them for child care scrambling for a replacement, and even fewer options for families to choose from in a dwindling pool of regulated providers. This is the story playing out across Wisconsin. Despite a national increase in the number of child care programs (Forbes, 2014), Wisconsin has seen a steady decrease in the number of regulated child care providers, with a loss of 1,250 such providers from 2011 through 2014. Why does regulation matter? Regulated providers are accountable to someone for the skills and knowledge they have and the care that they provide. Whether that means their program is certified or licensed, they must meet certain quality standards annually to maintain that status, ensuring a safe and healthy environment for the children enrolled. Furthermore, they are given vital supports to do so, including—depending on whether a program is certified or licensed and on their participation in the state’s child care quality rating and improvement system, YoungStar—opportunities for continued education, micro-grants to improve their program, parent referrals to their program from their local Child Care Resource & Referral agency, the ability to accept children participating in Wisconsin Shares, and to take part in the Child and Adult Care Food Program. Child care programs that operate without regulation, and possibly illegally, have not met verified standards and do not have access to formal supports. Regulated programs adhere to stronger standards that keep children safe and are more likely to prevent tragedies, like the recent death of an infant in an unregulated WI child care and similar stories that continue to crop up across the state. Basic safety aside, early childhood is a crucial period of rapid brain development. Studies show the experiences and education that children receive at an early age will help to determine their later success as adults, and as members of our communities. Children with strong, positive early supports and education have been proven to have higher graduation and employment rates, lower rates of incarceration and need for public assistance, greater social emotional stability, and an overall higher rate of success. Knowing this, do we really want Wisconsin children’s early experiences to be lacking? Wisconsin needs regulated child care providers. Yet we are losing them at a steady pace. The question is, why, and what can we do about it? While there is currently no single confirmed reason as to why regulated providers are decreasing in Wisconsin, there are a few challenges to the field that could be behind the shift. The cost of quality care is high—for parents and providers. Building a quality child care means that a provider is investing in improvements to their environments, cultivating their knowledge and education in early childhood, purchasing materials for the classroom, food for meals, etc., not to mention still having to pay themselves and any staff. Quality does not come easy or cheap. As such, higher quality programs cost more to attend, and the bulk of that cost falls on parents. While there are definitely supports in place to assist both providers and parents (Wisconsin Shares) in affording quality care, it is not enough. According to the 2014 Parents and the High Cost of Child Care national report, Wisconsin is in the top ten of the least affordable states for center-based care. This is likely because in Wisconsin, there is just not enough money in early education to go around. Providers struggle to achieve quality and sustain their business while families who are from lower and even middle income brackets struggle to find the money to send their children to high quality child care programs. Some providers may find it easier to give up on providing regulated care and either turn to a new career, or provide unregulated or even illegal care. Meanwhile parents are forced to choose between a high quality care that strains their budget or a lesser quality care that they can afford. Many will have to choose the latter, meaning higher quality programs lose that business and children lose out on a quality program. Child care providers are grossly undercompensated. Quality in early education means quality providers. You do not hire the 6-year-old down the street to do your taxes; you certainly do not want an unqualified person caring for your children. Staff participating in YoungStar, Wisconsin’s Child Care Quality Rating and Improvement System, are supported and encouraged to go back to school, to earn further credentials and knowledge, and to apply that within programs. Yet, more education means a higher pay rate—or at least it should. The majority of child care providers continue to be underpaid, earning an hourly rate in line with a retail or fast food worker. The truth is that many programs, group or family, do not have the money to pay themselves or their staff what they are worth; which is a lot. They can hike enrollment rates, putting the financial burden back on parents who may not be able to afford to stay, or, as many do, they can deal with staff turnover as they lose people to higher paying careers. Now those programs have not only lost quality providers that they have invested in, they have to start all over again building quality with someone new. There is ultimately not enough funding invested in early education to keep quality, regulated providers incentivized and supported, and in the end it is our children that lose out. You may not think this is your issue. But as we lose more regulated providers for our youngest citizens, we are not only short-changing future generations, we are short-changing ourselves by limiting the opportunities they have to grow and accomplish great things in the communities where we reside. The solution here is simple: Invest in early educators, invest in Wisconsin children and families. Every child should be able to access quality care. We should be growing quality, regulated child care providers, not losing them. What is a Parent Café? Think of a cozy coffee shop or restaurant where you feel safe and comfortable, and it is easy to chat with the person sitting next to you. 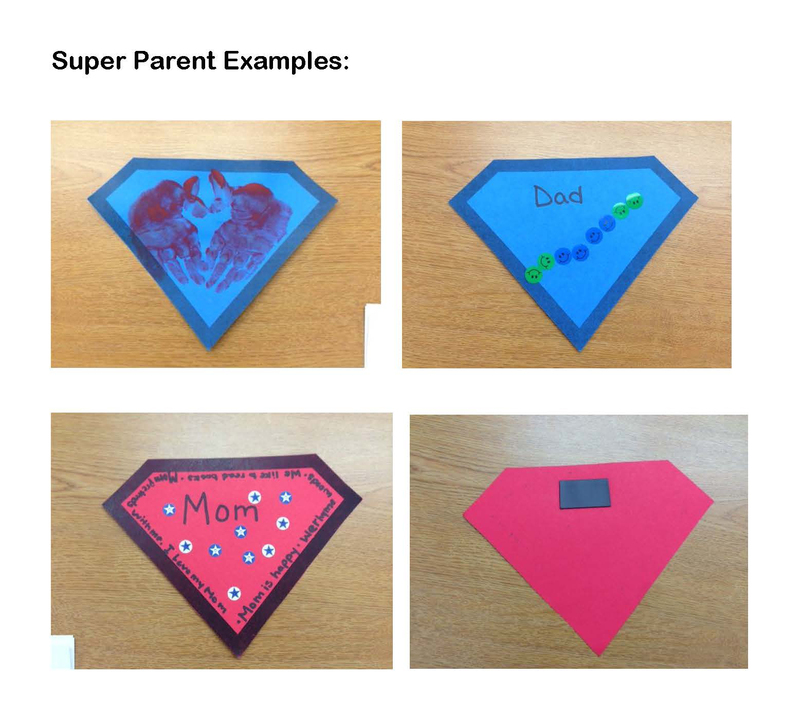 Parent Cafés guide parents to explore the Strengthening Families™ Protective Factors in a small group setting through a peer-to-peer learning process and individual self-reflection. Cafés provide a safe and nurturing environment for parents to have authentic, intimate conversations about their families and ways that they can strengthen their families and communities. 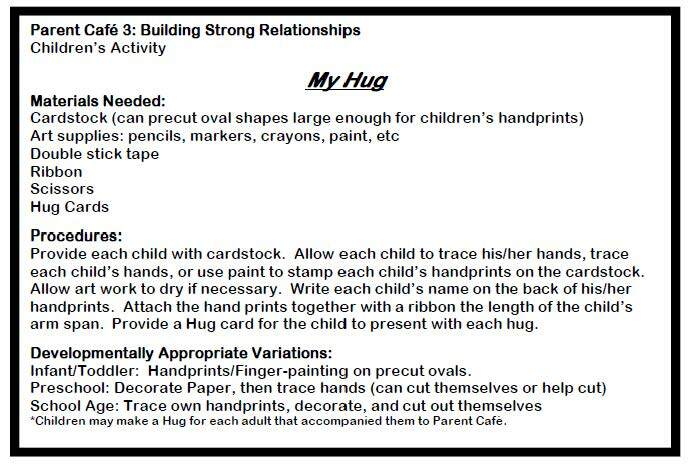 Parents build enhanced social and emotional skills and learn how to proactively respond to challenging situations. Throughout this process parents acquire the leadership skills necessary to engage, train and lead Parent Cafés within their own community. Supporting Families Together Association (SFTA) is partnering with agencies in 11 counties across Wisconsin to offer Parent Cafés to Wisconsin parents. 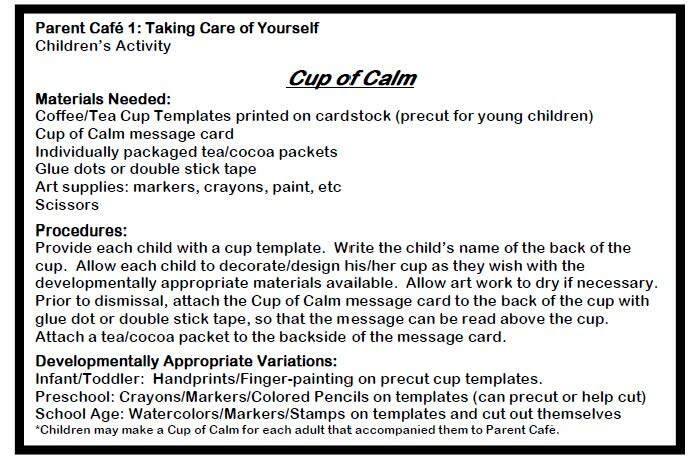 If you are a member agency participating in Parent Cafés, another agency looking to start your own Parent Cafés, or simply an educator or a parent looking for some fun children’s activities that celebrate caregivers, check out the 3 simple ideas below! 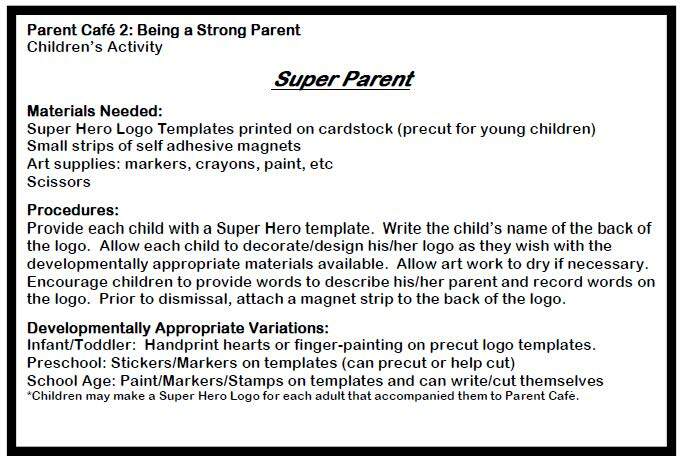 These pair perfectly with Parent Café themes– which are indicated– and can be used in a variety of other settings. 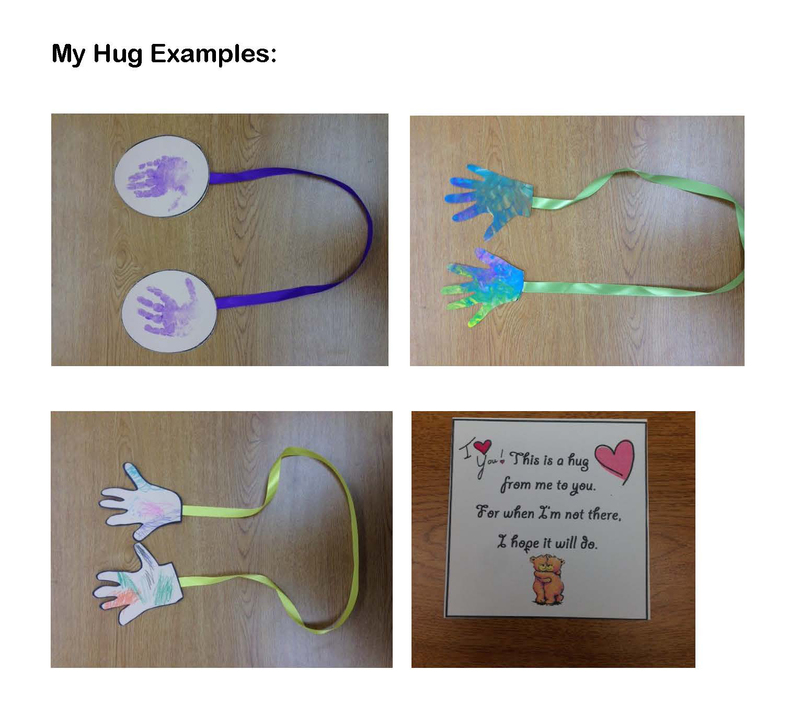 Thanks to Kendra Scherg of Kimberly, for these fantastic activities and examples! 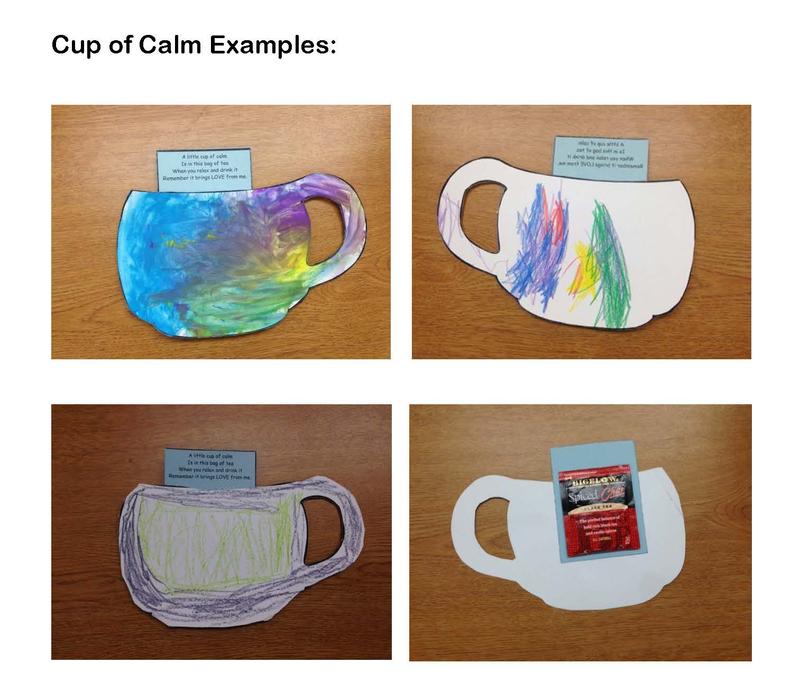 Find more Parent Café activity ideas on our Pinterest board. Stay tuned to our website to find out where and when Parent Cafés are happening and how you can register to attend a Parent Café in your part of the state! This Parent Café opportunity is available with funding from Race to the Top – Early Learning Challenge Grant through the Wisconsin Department of Children and Families. The sun is out, heavy clothes are hidden away; suddenly you are full of energy! Now is the time to recommit to healthy eating for your little ones, and you. Click to view the interactive version! Breaking unhealthy eating habits as an adult is harder than learning healthy eating habits as a child. As a child care provider, parent, or other adult in a child’s life, you have a huge effect on children’s eating choices and habits. Good nutrition keeps children physically healthy, so that they are prepared to learn and grow at their highest potential. Food need not be expensive to be healthy. Here is how to eat healthy without spending a fortune. Body image issues, like eating habits, form early in life. Ensure that as you teach children healthy eating habits you also teach them to embrace their bodies and appreciate their physical uniqueness. Rock and Roll Beef Wraps from Childcaring, Inc.
14 Brain Power Snacks for Your Kids from Family & Childcare Resources of N.E.W. Garden Veggie Flowers & More from Child Care Resource & Referral, Inc. Learn more about how you can help prevent child abuse and neglect by clicking the photo above. Small Change Makes a Big Difference Teach-a-Thon for Child Abuse and Neglect Prevention is NOW! Supporting Families Together Association (SFTA) is proud to announce our fourth annual Small Change Makes a BIG Difference Teach-a-Thon and campaign! SFTA is partnering with Child Care Resource and Referral Agencies and Family Resource Centers across Wisconsin to make positive, nurturing early experiences a reality for ALL children. Throughout the month of April we will provide a high volume of trainings that promote the 5 protective factors and prepare adults to prevent child abuse and neglect. Last year we reached over 1600 adults through these trainings. This year we are aiming to reach 1800. Can we count on you to help us reach our goal and raise funds to sustain our work on behalf of Wisconsin children and families? *Click the infographic picture below to learn more about the importance of child abuse and neglect prevention for each and every one of us. Contribute your small change for every adult we aim to train in April to support our work in promoting quality early childhood experiences. Give a penny, a nickel, a dime, a quarter, 50 cents, or $1 for each adult we aim to train in April. For instance, if you contribute a nickel per adult trained, yours would be a total donation of $150.00. Mail your contribution directly to SFTA, or give online right here! However you donate, you will receive a 2015 tax receipt, since all donations made to SFTA are 100% tax-deductible. Regardless of your profession, you can make a difference in a child’s life by understanding your role and responsibility in preventing child abuse and neglect. Contact us to find a training near you in the month of April. Thank you for your dedication and commitment to ensuring the best possible outcomes for young children! SFTA is committed to accountability & transparency. Visit our profile on GuideStar to learn more.